Hello, if you are hopping over from Jennifer at Decor Gold’s feature, thanks for stopping by! I’m excited to share my dining room for this one room Christmas Tour. I was so lucky to be able to join an amazing group of thirty other bloggers and each day this week a handful of us will be sharing one room in our home fully decked out for Christmas. Chris from Just a Girl Blog put this all together and wanted to make it easy by sharing just one room. It can be overwhelming sometimes to fit a whole house tour into one blog post, so this idea is genius! My dining room is becoming my favorite room in the house and it is currently the room I’ve been updating. My new Emmerson Table from West Elm has been the biggest update yet and my most favorite. Currently, one wall of the room is unfinished and shiplap is being installed, but it didn’t stop me from decorating for my favorite holiday! For my tablescape, I wanted to keep it simple but festive. 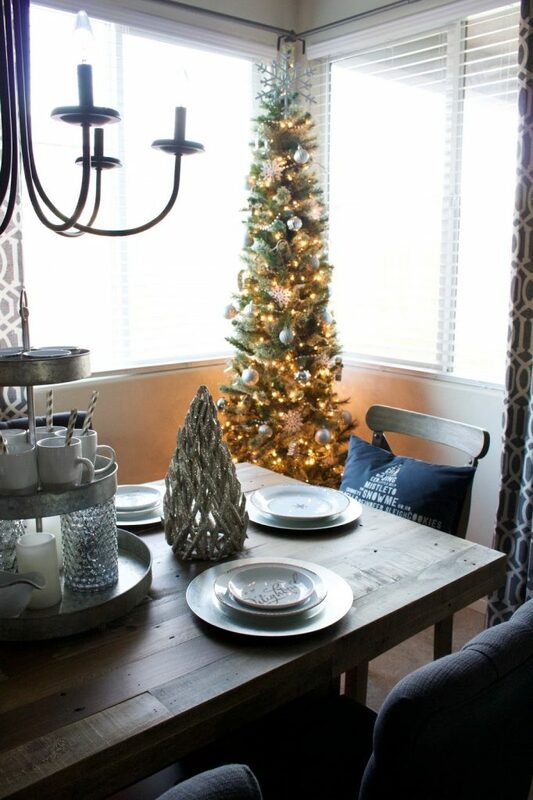 Glittery gold trees from Target and a galvanized three tiered tray from Joss & Main are an easy center piece. White coffee cups with festive silver & gold straws are ready for hot chocolate, and the tray can easily hold all the hot chocolate fixings for a party. Silver chargers and snowflake dishes from Target are displayed every year around Christmas time and are one of my favorite dish sets. I started collecting these dishes about five years ago, and luckily Target adds more and more to the collection every year! I love the rustic table with the glam of glitter and silver lining on the white dishes. Its the perfect mix of everyday decor and holiday decor. Pillows from H&M Home match my existing charcoal colored chairs, and our Lowe’s chandelier is still one of my favorite lighting updates in our home. I began a tradition of having a Christmas tree in the dining room last year with a smaller tree, but this year we upgraded to the pencil version of our living room tree. I absolutely love it, maybe even a little more than our bigger tree. He’s just so cute and skinny! 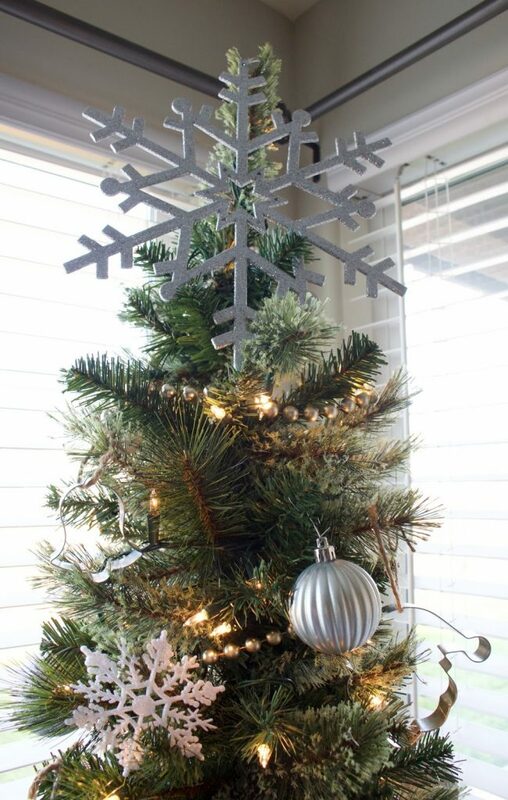 I kept the tree decorations simple with silver ornaments, snowflakes, some gold garland, and metal cookie cutters from Target. After all it is a dining room tree and open to our kitchen, so the cookie cutters add a touch of whimsy. The smaller ones were 79 cents and larger only 99 cents. I even bought one for the dog! I kept the top simple with a large snowflake that I’ve had for years. I guess snowflakes have always been my theme each and every Christmas. It never snows here in California, so it’s my own little white Christmas. Hope you enjoyed the tour! 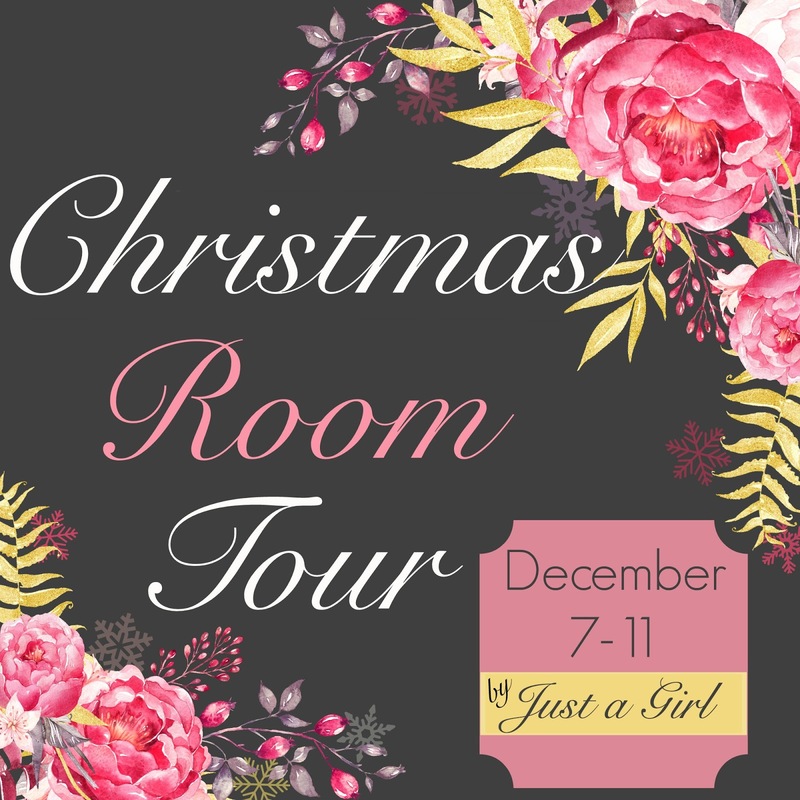 Don’t forget to follow the blog hop and check out all the other bloggers beautiful Christmas Rooms – next on the tour for today is Thrifty Decor Chick & tomorrow starts with The Nester! Beautiful!! Love those plates and the tiered tray!! It all looks so pretty! Love the tree and those plates! Gah! I love the slim tree so much! Actually, scratch that. Love it all. The room is so cozy and warm and festive. I also loved seeing how you used your three tier tray. I never know how to style mine.